Trossen Robotics Contest #9 Winners! 2012 has come and gone, and its finally time to announce the winners for the Ninth Trossen Robotics Community Contest! There were a lot of amazing entries, but six of them battled to the top to win our contest. Check out the end of this post for videos of all of our winners in action. The Obstacle Avoiding & Remote Controlled Rover (or the OARC Rover) is a great little project by Yosheli. 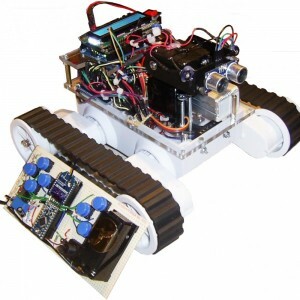 It has everything you need for a roving robot – a drive system (4 DC motors with encoders controlling 2 treads), a distance sensor (an ultrasonic range sensor), wireless communication(XBees) and a main processing unit (an Arduino Mega). This robot has a two modes of operation – the first is direct remote control via a custom wireless controller. The second mode is a purely autonomous one. The OARC Rover will go forward until it detects an obstacle – at which point it will move to avoid the obstacle. To help overcome the limits of the ultrasonic sensor, Yosheli mounted the sensor on a pan servo, enabling the robot to get better readings on curved surfaces. This panning motion also gives this little robot a lot of character. Yosheli will be receiving one of our RoboTurret Vision Tracking Starter Kits. 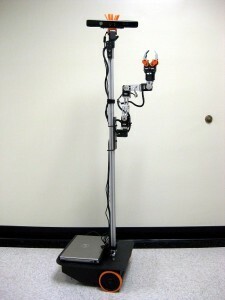 Maxwell is lnxfergy’s Mobile Manipulator Robot. This robot can map a room and traverse the room based on that map. 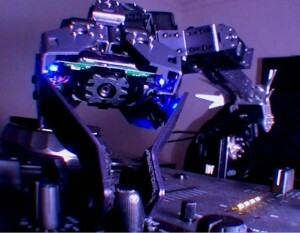 Then it can use its custom arm and manipulator to pick up objects and interact with the room. The latest version of Maxwell even has a linear actuator to move the arm up and down, allowing it to pick up things from the floor as well as table-height objects. Maxwell’s arm is comprised of 2 EX-106s, 2 RX-64s and 3 AX-12s. Lnxfergy’s did a lot of work in ROS to get his custom manipulator running properly, which is a great thing for the robot community. 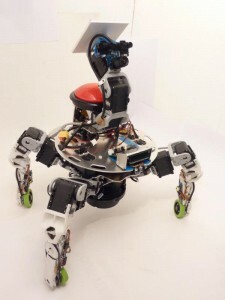 Lnxfergy’s is commited to open source projects and his work in open source robotics has been the basis for robot after robot in the comunity. We absolutely love that Lnxfergy has made all of Maxwell’s code available. Check out this thread post for mor information about Maxwell. Lnxfergy will also be receiving one of our RoboTurret Vision Tracking Starter Kits. 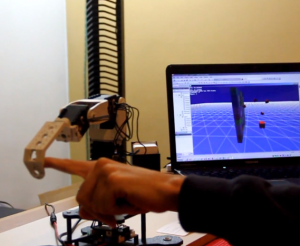 At first the VIMPHIN looks like a standard robot arm – but it’s actually an interface for a physics engine! Each joint in the VIMPHIN is mapped as a virtual point in 3D space. In this 3D space, different objects and materials are created around the virtual VIMPHIN. As you move the real VIMPHIN, the virtual VIMPHIN will ‘collide’ with the virtual objects and materials. As this happens, the real VIMPHIN will adjust its torque to simulate resistance through denser materials (like water) and even ricochet from solid objects (like a brick wall). The applications for the VIMPHIN include training, taking virtual tours, and even gaming. We’re definitely excited to see how the VIMPHIN matures and what kind of other applications might use it. DiegoSpinola will get one of our RoboTurret Vision Tracking Starter Kits. There’s a bit of debate on whether Gertlex’s Twitch is a hexapod, a quadruped, or a biped. But one thing that’s not being questioned is that this robot is awesome. Twitch gets around using only 3 AX-12A DYNAMIXEL servos, and is surprisingly agile. Twitch’s gaits are controlled by a Pololu Wixel and a second Wixel communicates with an ArbotiX Commander for direct control of the robot. Twitch’s unique gait and low cost make it a very intersting robot. Gertlex had quite a few challenges to overcome when building twitch. First, his inspiration was only documented in a low quality youtube video, so he had a lot of design to figure out on his own. Second he had to get his Wixels to interface with the 3 DYNAMIXEL servos, and with the ArbotiX Commander/XBees. He also had to port the WebbotLib to his Wixel. It’s easy to think that Twitch’s legs were laser cut, but they were actually hand cut out of delrin using a dremel. Several of twitch’s other parts were made with a cupcake 3d printer. Gertlex has some great documentation on his project page and in his thread , chronicling twitch from a 3D-model, to cardboard-legged test unit, to the robot it is today. 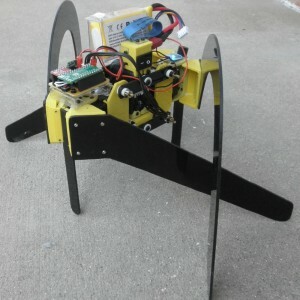 As one of the second place winners, Gertlex will win one of our PhantomX Pincher Robot Arm Kits. When you hear ‘robot arm’ you might think of a heavy duty industrial arm performing monotonous, repetitive actions. But what if we could change that pre-conception to that of something more exciting and more interactive? To get everything working just the way he wanted it, the DYNAMIXEL SDK wasn’t up to snuff, so HyperCube implemented his own hand-crafted communication stack to control his two arms. HyperCube’s Documentation includes his list of tools, details on camera modifications, and even the code he used to move his arm using cubic splines. We love to see robots that interact with the public, especially like the Interactive Robot DJ. Not only can these robots do some amazing things, but they can also get the public interested in and excited about robotics. This kind of inspiration serves to grow the community and help advance the field of robotics. As the second place winner, HyperCube will win one of our PhantomX Pincher Robot Arm Kits. Maybe HyperCube will turn this duet into a trio! Inspired by the Tachikoma walker/roller from the Anime “Ghost in the Shell”, the Xachikoma is a quadruped/rover hybrid. That’s right, this quad has 4 wheels that will quickly move it around while its legs can be used to overcome obsatcles. A Beagleboard-xM controls the robot, reading inputs from the 3 main sensors ( a LIDAR, a Playstation Eye, and a CMUcam3+) and control its actuators to accomplish basic tasks. When the robot competed in Eurobot 2011, the robot would find and move ‘pawns’ on a giant chess-board. In the Xachikoma Thread Xevel goes through his calculations and simulations for the 4DOF IK code that Xachikoma runs. This thread also details the physical build process and has plenty of videos showing the progress of the Xachikoma. To everyone who has entered: thanks for your entries! Seeing all your projects inspires us to put everything we have into serving the robotics community. We’ll be announcing the tenth TRC contest soon, so keep on building and stay tuned for your next chance to win. This entry was posted on Thursday, January 10th, 2013 at 2:46 pm	and is filed under Announcements, Competitions / Contests, Front Page News, Misc. You can follow any responses to this entry through the RSS 2.0 feed. You can leave a response, or trackback from your own site.